The 2014 FIM Freestyle MX Champion has been crowned. 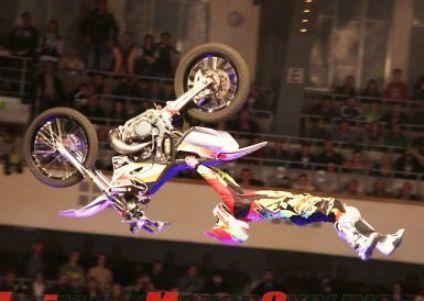 NIGHT of the JUMPs on Saturday in the Frankfurt Festhalle in Germany brought the season to a close. In a thrilling finale, Spain’s Maikel Melero claimed the title of 2014 World Champion. 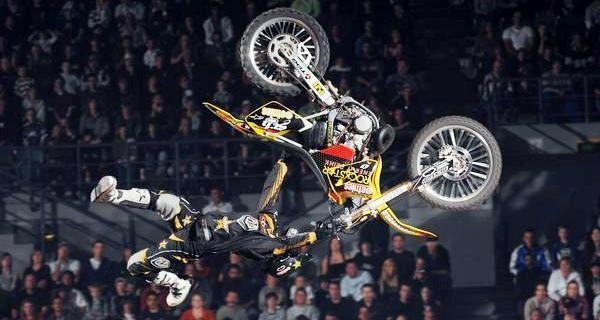 Ten FMX riders from five different countries contested the final round of the FMX World Championship. With Maikel Melero and Remi Bizouard separated by only eight points, the tension was already palpable in the qualifying heat, as failure for either would have brought a premature end to the title chase. But luckily for the fans, both were in excellent form to take them through to the final. As on Friday, the top qualifier was David Rinaldo. Joining him and the two main contenders were Petr Pilat, Jose Miralles and Brice Izzo. To the chagrin of their local supporters, the German contingent were out of luck. Hannes Ackermann missed out on the Top Six by a wafer-thin margin, Lukas Weis was ninth, and Luc Ackermann dropped to the back of the field after a hard fall on his Surfer Tsunami Flip. UK veteran Jamie Squibb also went out at this early stage but at least took the victory in the LifeProof Best Whip contest. With the younger Ackermann still nursing his wounds, the Maxxis Highest Air was reduced to a two-horse race. But to the great delight of the spectators, Lukas Weis and Jose Miralles pushed the bar up to nine metres. The ultimate winner was Miralles due to fewer failed attempts. Next up was the championship showdown. Bizouard not only needed to finish ahead of Melero to land his fourth title, he also had to have three other riders between himself and the Spaniard to close the eight-point gap. So the Frenchman pulled out all the tricks in his extensive repertoire, including Ruler Flip, Cliffhanger Flip, Hart Attack Flip and Whipped Seatgrab Flip. For the double-up, Remi shrewdly selected the Body Varial to put himself in the hot seat and pile the pressure on Maikel. The Spaniard opted for a safe run with Doublegrab Flip and various combos. He chose to omit the Flair which had ended in a tumble the day before, a tactic that proved to be the right one. Although his less than ambitious run was nowhere near strong enough to dislodge Remi from the hot seat, it was enough to keep him ahead in the standings, with only David Rinaldo splitting the two leaders on the night. After a long season, Maikel was a worthy champion. Remi not only took the win on the day with his fantastic Body Varial but also picked up the Rockwell Best Move Watch. With this last competition of the 2014 season, NIGHT of the JUMPs now goes into hibernation. The new season begins on 10th January in the Bulgarian capital of Sofia. A week later, the European Championship starts in Linz. The first world championship points will be awarded in early March at NIGHT of the JUMPs in Berlin.